If you look inside of ‘HS1501 AL’ package, probably make a smile of satisfaction. You can see a refined aluminum container, which contains ‘HS1501 AL’ unit and its cable separately. And contains a glossy dark-brown leather carrying case containing a Velcro type cable-tie and a leather one as well. Also, there are all different 8 pairs of ear-caps too. The HS1501's silver-colored chamber containing its driver is the design of aluminum, and its blue housing is made of stainless steel metal. The handle on the back of the chamber is CNC machined, which is helpful in picking up the unit and plugging into ears. The nozzle size is a general size(4mm) so that compatible with various 3rd party ear-caps. The screw parts of the housing connection feel a little bit bumpy, so may be inconvenient to wear depending on the shape of listeners’ ears. The stock cable is crafted of oxygen free copper wires (made in Japan) and covered with thick rubber insulation, which gives a feeling of firmness and good durability. This feature can cause difficulty on first use and give microphonic. Thankfully, wearing it in over-ear is much helpful for reducing microphonic. The HS1501 adopts the MMCX connectors and is well compatible with 3rd party custom cables. 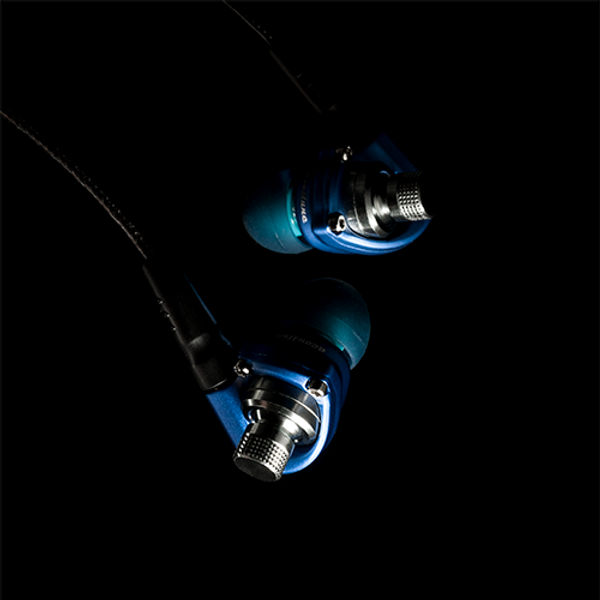 HS1501’s sound signature is like W-shaped with emphasized treble and bass. The harmonic of the mid-range and treble is bit textured and expresses in bright-colored. The upper treble is slightly exposed to sibilance without listening fatigue so that HS1501 sound cymbal, snare, guitar, and even female vocal’s feeling of textures quite naturally. With the music source intentionally mastered in high dynamic-range, its sound doesn’t cause stronger sibilance, but the details of the middles are clumped and become unclear for monitoring. The harmonic of bass is dense and thick and shows rapid response characteristic. This feature reminds that heavy mass things explode diffusively and fade away fast. And HS1501 helps to hear the harmonic texture of the brass instrument and feeling of drums’ hitting, because of boosted mid-bass. The reverberation of the mid and deep bass is rolled off quickly and had little impact on the overall sound tone and less masking. However, the detail of the bass is unclear for sorting ground-notes because the mid-bass is emphasized excessively. HS1501 expressed stable stage performances with one step close main instruments right in the center and the rest of the instruments playing properly around. Even if a lot of brass and percussion instruments with heavy harmonics, the main instruments in the center didn’t cause unclear imaging. With this advantage, it helps not to leave the mastering intention of the music source and listen to the various genres of music. If increase the volume above a certain level, the low-frequency and high-frequency’s reverberation reduces, and their harmonic strongly condenses and emits. So, the main violin and orchestral bands of ‘Max Bruch's Violin Concerto No. 1’ give breathtaking harmony which is like competing against each other. Even though the composition is complicated orchestra performance, HS1501 presents enough liveliness to the listener. The HS1501 is designed for portable audio devices, from smartphones to portable digital audio players (DAPs). The tonal range of sound-signature according to devices is not large. But still, the better output stability of the device offers more headroom on mid and bass, so that listeners can get more detailed and richer expression of harmonics and imaging. When connected to the balanced (2.5mm or 4.4mm) output terminal, the stage moves backward two steps and gets widened, and the texture of the overall harmonics becomes smoother. The Acoustune HS1501AL was offered by ‘Acoustune’. The content of the review has been written without any restriction because the authors' freedom is respected.